gardening in the boroughs of nyc: The good and the bad! Your right. But I would like weeds if I get tators like that.If I weed the only thing I get is a back-ache :) Those Tators are very nice. I might try some next year. Do tell your secrets? Did you plant in the ground or cages this year? I was disappointed with my cages! 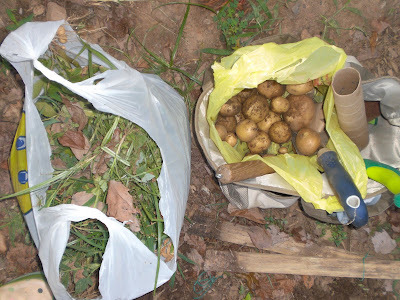 A very nice haul of potatoes, what kind are you growing? I've been doing nothing but weeding this week so I can feel your pain! Weeds are not all that bad - they are great for compost! Your right, but to me the good out weights the bad!! !